I am writing this blog post from my office computer on campus at 10pm at night because, as we speak, my computer is stuck with the Engineer-in-My-Life, R, and is getting two OS-es updated (Snow Leopard + Win7). So, I trekked all the way out here to work to blog about pancakes. Yes, because it's *that* important to me. 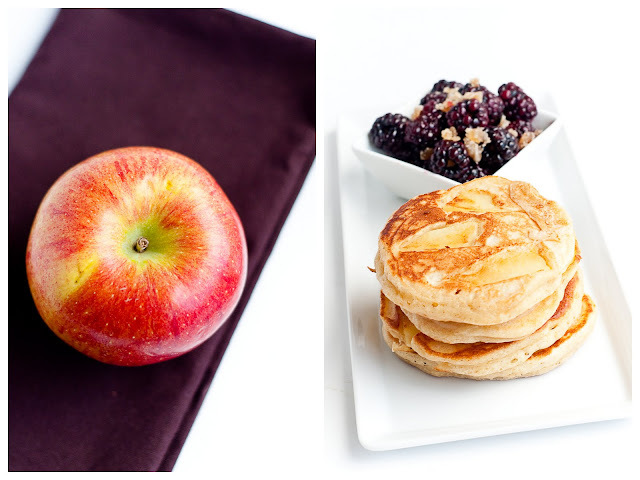 Today, I have for you: Apple-Ginger Pancakes with Warmed Blackberries. mmmmm. This year actually hasn't been such an apple heavy year for me. Sure, I made my customary apple pies around Thanksgiving and Christmas and even whipped up an apple pie version of pancakes. But other than that, I haven't really been eating many apples this year, and I have no idea why! But, when I went grocery shopping the other day, I walked right by a display of apples and *whiff! * it hit me-- the glorious, fresh, crisp scent of a perfectly snappy, juicy-yet-slightly-tart apple. And so these pancakes were born! 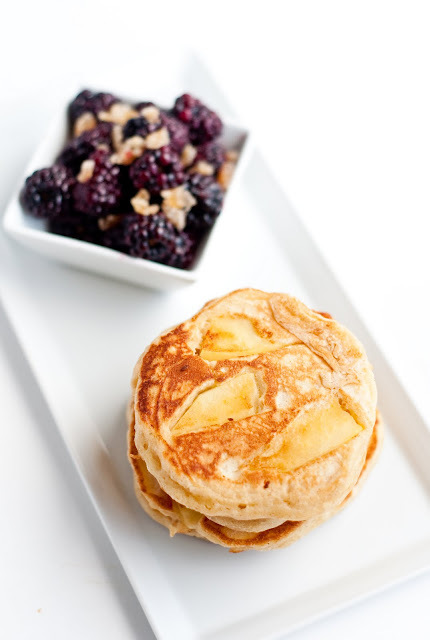 Lightly ginger-y, incredibly fluffy buttermilk pancakes studded with huge pieces of freshly sliced apples and crystallized ginger chunks. 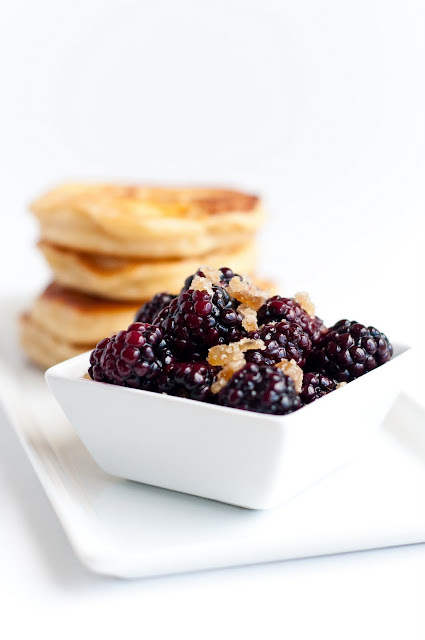 Accompanied by lightly warmed and sweetened blackberries, tossed in a pan with a dash of sugar just until they begin to release their flavorful juices. 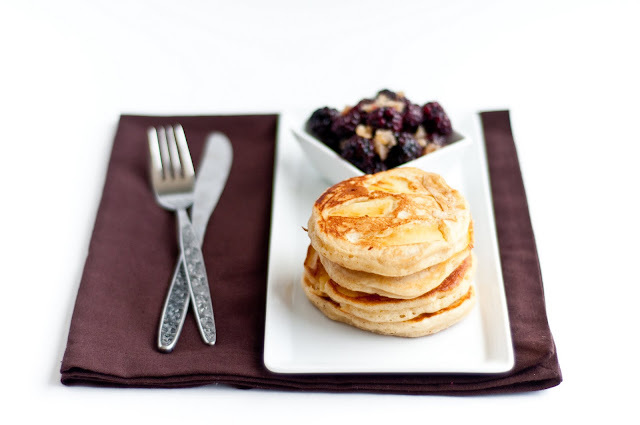 Together, the apples and blackberries create the perfect medley of sweet, fresh, and tangy fruit, united by the spiciness of ginger and cinnamon in the pancakes. Helloooo, Sunday morning. Anyways, here's hoping that my computer will be usable soon enough! Excited about having updated OS-es and hoping that they greatly improve the stability of my system. :-D Have a great week, all! 1. Combine buttermilk, milk, eggs, melted butter, freshly grated ginger, and vanilla extract in a bowl and whisk thoroughly. 2. Add the flour, sugar, cinnamon, baking powder, and salt and mix until smooth. Batter should be thick and fluffy, but if it is too thick and difficult to stir, thin it with a tiny dash of milk. 3. Oil lightly a medium hot skillet. Cook the pancakes slowly over medium heat, making sure that your skillet is always well-greased. 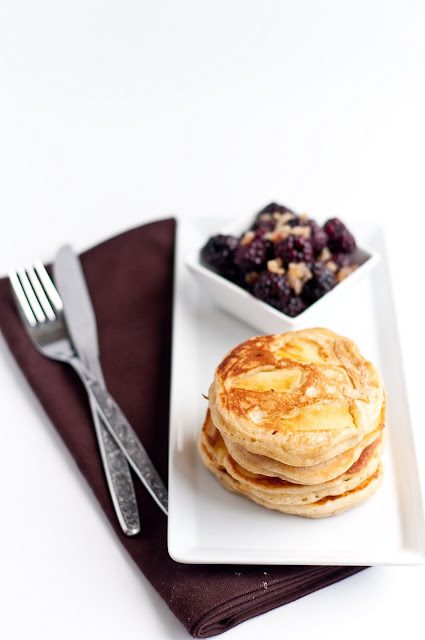 When cooking the pancakes, place the apples and crystallized ginger chunks in immediately after you pour the batter onto the skillet. 4. In the same pan after the pancakes have cooked, add the blackberries and remaining sugar. 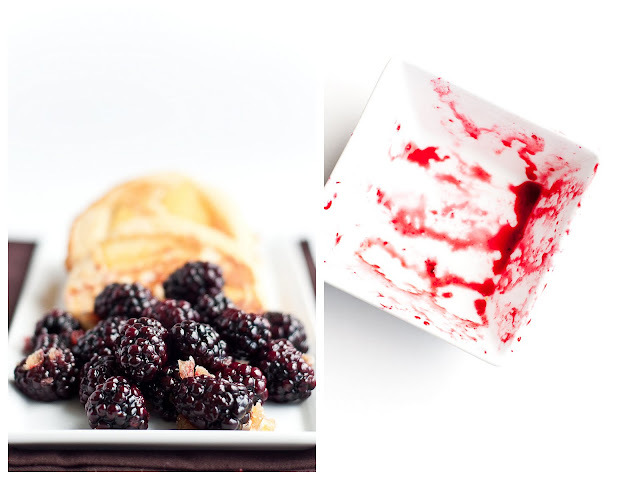 Cook over medium-high heat for a quick minute or two, just until the blackberries begin to release their juices. Immediately remove from heat and serve on top of hot apple pancakes. Tip: I wouldn't skimp on the buttermilk since they provide these pancakes with the fluffiness that you need in order to hold the apples in. Tip: This pancake tastes better if lightly fried in oil rather than cooked. Use a good amount of oil, cook slowly on medium heat until each side is golden brown. These look delicious, and simply have to be healthy with all that fruit. I like the idea of adding ginger to a pancake; will have to do so with a crepe! Thanks for the inspiration! @Ashley: you're welcome! Please let me know how the ginger-in-crepe thing goes. It sounds delicious. 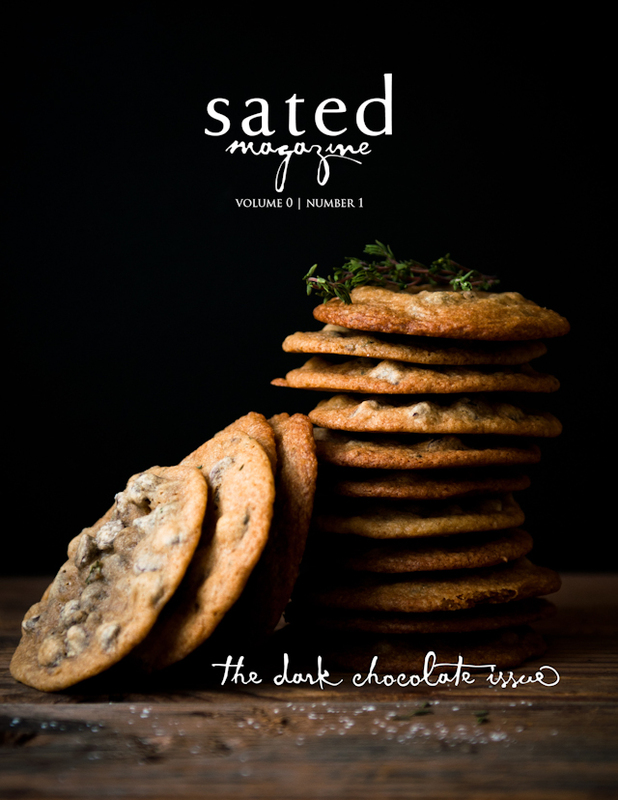 That looks divine, I could have some right now. Yum! @Mowie: thanks! There were indeed divine--really wish I'd made more than I had! Apple, ginger, and berries are such a killer combo! And you are one devoted blogger, but I can't say I'm any less obsessed *cough* I mean dedicated 8). I would probably do the same if my office weren't an hour commute away. I'm surprised to notice you didn't use buttermilk in your other pancake recipes. Do you think normal milk tastes better but buttermilk tastes better with a slightly fried pancake? Your pancakes always look so tasty..they're my sunday morning ritual food. @Iris: Great question! 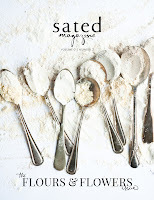 I would actually prefer to use buttermilk in the majority of my other pancake recipes, with exception of some where the batter should be lighter. The reason that I usually use milk, though, is just that buttermilk is not as readily available--that is, I don't just have it lying about all the time. For most recipes, replacing buttermilk with milk gives comparable results, but this recipe in particular really called out for the dense but fluffy texture that buttermilk has.